Nagle has not only been landing quality commitments from Suffolk County but from his own alma mater. 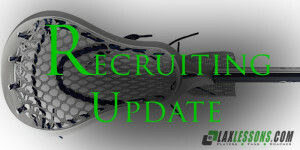 The latest comes from junior Connor Grippe, a decision first reported by Joe Lombardi on LaxLessons.com’s Lacrosse Insider premium coverage section. The hard-working feeding attackman has outstanding field vision and is especially efficient when operating from the X position. Stony Brook offers great academics and opportunities beyond college. Also, the coaching staff and atmosphere surrounding the athletics is an experience I am really looking forward to. Lastly, the proximity to home sealed the deal. Throughout the process, I considered Stony Brook, Hartford, Siena and Villanova. I believe my biggest strengths are my lacrosse IQ, my vision as a feeder and my riding. Developing a more consistent outside shot and becoming more of a threat off the ball. My dad (a WM alumni) introduced me to the game when I was 3. In the past I have also participated in playing basketball and soccer. I play for Patriot Elite Green in the summer. Over the summer, we played in the LI LaxFest, Legacy Invitational and the National High School Showcase. I participated in many events in the fall such as the Philly Showcase and NXT. I would like to thank all the coaches I’ve had through the years that have helped enhance my game to the level it is at today. All of my youth coaches, (Ward Melville Head) Coach (Jay) Negus and (Assistant) Coach (Chris) Muscarella, have given me the tools to be successful and I appreciate everything they’ve done up to this point. Also, I could not be in these circumstances I am in today if it wasn’t for my family. My dad taught me almost everything I know and I couldn’t be more grateful. And also my mom, who has driven me all over the east coast for various lacrosse events.